When you're digging for CES gold, you can usually ignore about 99.99 percent of the iPhone accessories announced at the show. But in that last 0.01 percent is where you can find some real treasures. 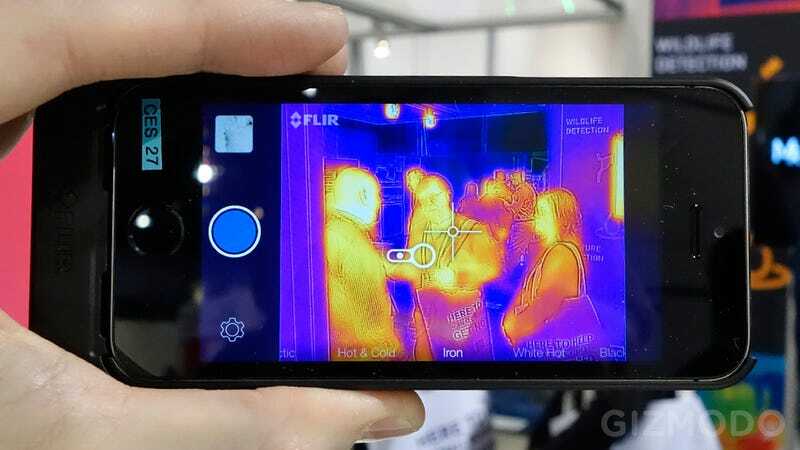 This year FLIR has managed to shrink the same thermal imaging technology it sells to law enforcement and the military so that it fits inside an iPhone 5 case—letting us civilians share in the fun too. Why two cameras instead of one? While one is generating the actual thermal image, the other is a standard camera lens that the FLIR app uses to generate and overlay outlines so that it's easier to recognize humans, objects, and even text. That's apparently a first when it comes to FLIR cameras, and it's designed to make it easier for regular consumers to tell what they're looking at.